How to book your wedding hire for your special day! 1. Check availability for your wedding date. Ring or text Tracey 07904 190 831. Please include as much information as possible to help us make up an accurate quote for you. 5. Pay deposit - £150 deposit which secures your booking. Payment methods - Cheque or Bank Transfer or we can organise Debit/Credit Card payments. We can offer payment plans - please ask. 6. Pay balance, to be paid 6 weeks prior to your wedding day. 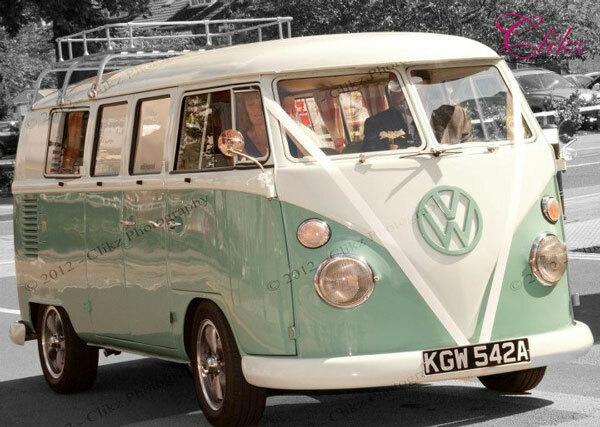 Or did you want to book a campervan for your holiday? Emails - check your spam folder if you don't receive a reply within 24hrs, we always reply, we know how important your day is to you! Please take a look at our 170+ reviews to gain confidence in our bespoke service, don't take our word! We hope you find our quote acceptable, we would love to join you on your wedding day with one or both of our amazing campers.